Our Semi Auto Double color Pneumatic Pad printing Machine is an easy to operate, user friendly advanced technology especially suited to printing on surfaces of any shape, with precise registration and high speed. Our organization is renowned as the distinguished manufacturer and supplier of Semi Auto Pad Printing Machine. Offered machine can print Electronic & Electrical Parts, Automobile Parts, Gift Items, Home Appliances, etc. This machine is examined on defined industry standards under the supervision of our experienced professionals to eradicate all the flaws. We make use of high grade raw material for the fabrication of this machine that is sourced from the reliable vendors. We are into Manufacturing and Exporting high quality Semi Automatic Pad Printing Machine. 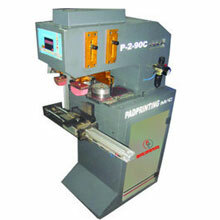 These machines are used for printing Electronic & Electrical Parts, Auto mobile Parts, Gift Items, Home Appliances etc.